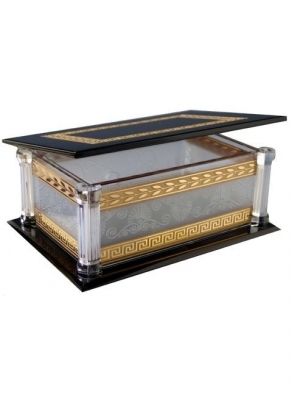 This extraordinary chest features handmade crystal corner columns in the Roman style. The deeply etched filigree and leaf patterns are infused with 24 karat gold and the glass panels are deeply etched with a whimsical floral pattern. 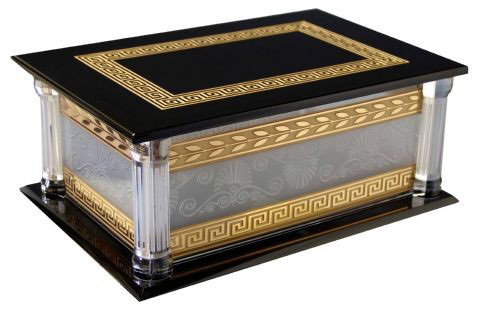 The top lid also has a 24k etched filigree pattern. This chest is truly a unique design and is a limited edition of 100 pieces. Schlanser also produces another version of this chest for the White House with the Presidential Seal etched on the top lid. President Obama uses it as a unique gift for high-level foreign dignitaries who visit Washington. Housed within is an Orbita Rotorwind triple watchwinder fitted with Lithium batteries. Battery service life of 5 years is guaranteed. The unique winding action is both quiet and gentle and watches can never be overwound or overstressed.